Project Based Learning is an outlet for students to practice utilizing their knowledge of the subject matter, demonstrate and communicate ideas to an audience, and familiarize themselves with real-world issues and potential solutions accompanying them. Through the use of key knowledge, reflection, self-critique, revision, and various other project designing elements, students experience the modern thinking techniques in Project Based Learning. Students focused on exploring the architectural and economic impact first river systems like the Nile River Valley have made on modern versions, such as the Mississippi River, here in the United States. Students in Ms. Conte's art class designed and built operating carousels using STEAM-based learning. Science- Students created simple mechanisms incorporating gears and closed circuits powered by batteries. Each group wired their own carousel applying what they learned about conductors, positive and negative charge and the flow of electricity. They wired in a potentiometer ̶ to be able to regulate the speed. Technology- Students researched each period of art, used laser cutters for their parts and 3D printer for some of their pieces. Engineering- Students created "I" beams and columns to provide structural support. They were concerned in making a structure strong, the weight distribution of their parts as well as making it aesthetically interesting. Art- Our project is based on a representation of art history. The students applied their knowledge of the elements and principles of art to combined color, line, texture, and value to create their visual designs. Math-Students applied their understanding of size relationships, ratio, proportion, and measurements to construct their designs. 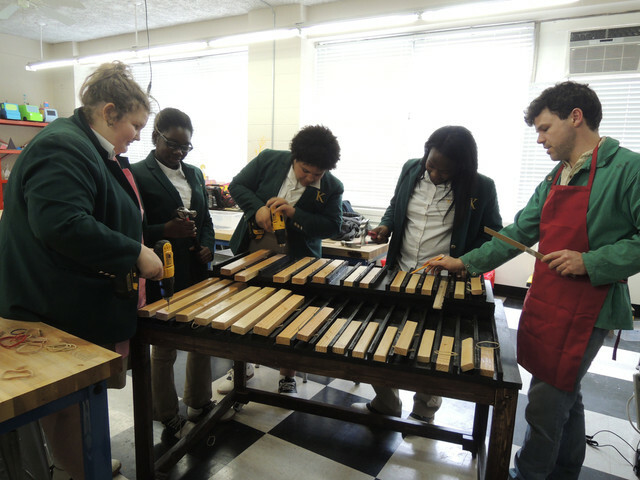 Students in Ms. Rege's music class used the CNC machine and laser cutter to create a wooden Marimba, a percussion instrument, and a metal Glockenspiel, similar to a xylophone. Students in Ms. Conte's mixed media class incorporated technology in their jewelry designs. Students researched and discussed known designers to gain knowledge and understanding of design elements as well as marketing and merchandising techniques. 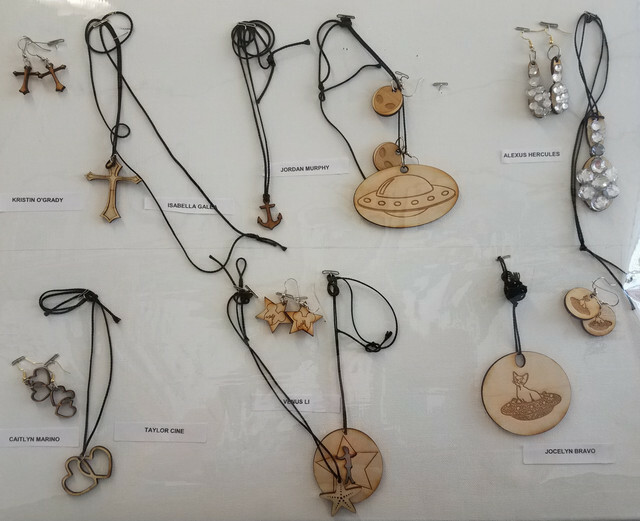 For this project, each student was asked to create a pendant and earrings implementing software learned and to prepare their designs for laser printing. Students in Ms. Marshall's health class used TinkerCad software to design trucks that display the benefits and health risks of popular diets. The trucks were cut using a laser cutter. Students in Ms. Rege’s Music Appreciation and Band classes recently created their own “Coachella” inspired music festivals from different historical time periods. The students created merchandise to market at their festival using the vinyl cutter and heat press. 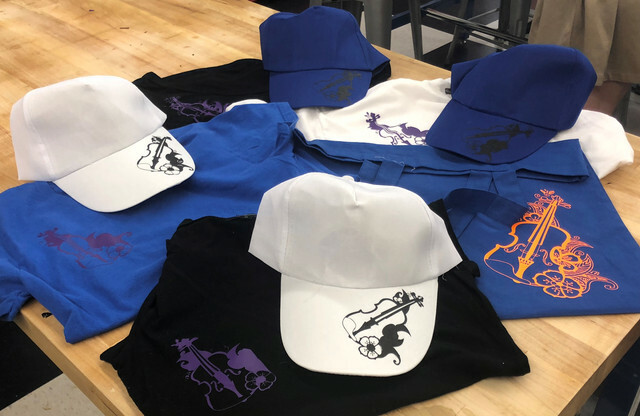 The students designed their own logos to be displayed on the hats, bags and t-shirts. At the end of the project, the students presented their festivals to the class and gave general and biographical information on the time period and composers for that era. During the summer of 2018, Bishop Kearney will be participating in BaseCamp Expeditionaries, a social entrepreneurship experience for our exponential age. Bishop Kearney will be the only all-girls school and only non-Jesuit school participating in this unique program. Through the generosity of National Grid, five students will participate as Patricia Michel Scholars and two faculty members will participate for Professional Development as Patricia Michel Fellows. Experience what it means to be "social entrepreneur"
Bishop Kearney's STEM program expanded in the fall of 2017 to include a state-of-the-art STEM Wing! The STEM Wing includes an updated Chemistry Laboratory, Music Room, and TV Station, as well as a Think Tank and Fabrication Laboratory (FabLab). The Think Tank is a collaborative and innovative space that was inspired by the corporate offices at Google and Facebook. This comfortable and creative space is for students and faculty to prototype, think through ideas and problem solve. A FabLab is a workshop of manual and cutting-edge tools that serves as a platform for project-based learning and teaching. FabLabs link art, design, and technology to expand the notions and applicability of science, technology, engineering, and math. The multilevel expansion is being funded through the support of our corporate, foundation and alumnae supporters. It is through their generosity that we are able to continue to enhance the educational and internship opportunities for our students.